Simply delicious, served with rice and a side salad. Creamy Goats Cheese - 1 - 8 oz. pkg. 1) Place chicken breast in container with 3/4 bottle of Garlic & Mango Dressing. Marinade overnight in fridge (may be in fridge up to 2 days). 2) Take flattened chicken pieces from marinade and open. Spread with 1-2 oz. of goat's cheese. 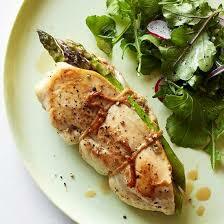 Trim raw asparagus, laying 2 pieces across the chicken breast. Roll or fold over chicken securing with butcher's twine or pick. 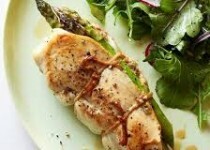 3) Place chicken in greased oven-proof dish and pour remaining Garlic & Mango Dressing over top. Cover securely with foil. 4) Bake 350F. oven 1 hour 15 minutes until chicken is cooked through. Check during baking, adding a little water if dressing has evaporated.